I am writing in pure amazement, to inform you that I am smitten by your products. The health of my hair has been a lifelong battle for me, and after having used your products just ONCE I feel almost victorious. A bit of background is necessary: I have wavy/curly hair, extremely thick, and what some may call unruly. For nearly a decade now, I straighten it. Twice every week. Like clockwork. If my hair isn’t straight, it’s in a bun. I have worn it curly maybe a handful of times in my whole adult life. I washed my hair with your shampoo and conditioner earlier today, and I couldn’t believe my eyes (and nose, and hands)… my hair looked, smelled and felt SO soft and wonderful. My hair’s problem is thickness and volume combined, which is a disastrous cocktail, because the average hair-clip doesn’t usually contain them. For the last three hours, my hair has been casually held up in a bun with a clip that is the size of my fingertip – because they’re not static-y and dry. The converse being extremely oily and wet-looking, which is disgusting. None of that today – My hair shines with just the right amount of moisture, doesn’t weigh it down but holds down the strays. Exfoliating your body is pretty high on the list of importance. Exfoliating the body not only feels great but it super helpful for all those other rituals like shaving and self-tanning. If you’re body is nicely exfoliated it makes shaving and applying those self-tanners a breeze! I have used a lot of drugstore brand exfoliating products and they do an OK job for the money. Using the Chaacoca Moroccan Black Soap – Citrus* and Moroccan Exfoliating Mitt and has been an amazing spa-like experience! The first step to using this product is hydrating your body in a hot shower for 5 minutes. This is important for the product to work effectively. The soap, which comes in a generous 8 oz tube, is to be smoothed over your whole body working in with a circular motion. There will be no lather, you are just covering your body with the soap using only your hands. I don’t suggest using any type of cloth or bath sponge, it defeats the purpose of the whole process. Leave the soap on your body for 5 minutes. This was the most challenging for me, to stand in the shower for 5 minutes and wait! I had to move the shower head spray to the side so I didn’t get washed off before the 5 minutes. After the 5 minutes, rinse off with warm water and then it’s time to use the Moroccan Mitt! The Mitt is used in a circular motion and layers of dead skin will roll off onto the Mitt. The texture of the Mitt will be rougher than your normal bath scrub but it shouldn’t bother you after a bit. Then it’s time to rinse again and wash off with your regular body soap. The end result is by far the most gloriously soft, smooth, moisturized skin you have felt all week!! 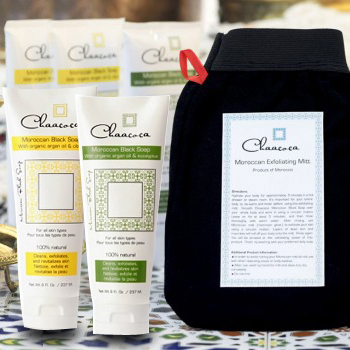 Product: Chaacoca Moroccan Black Soap with Organic Argan Oil and Citrus or Eucalyptus, and Exfoliating Mitt. 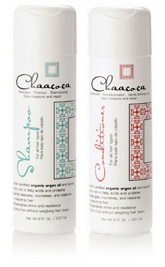 Chaacoca is on sale on Sneak Peeq!